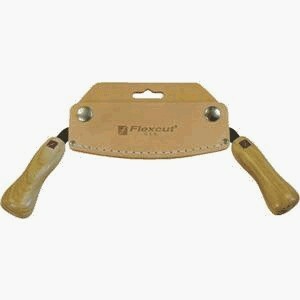 Lighter than traditional drawknives, this curved drawknife with 5-inch cutting edge from Flexcut was designed for carvers rather than wheelwrights and coopers. Flexcut created this small drawknife from high carbon spring steel with shanks tempered for slight flexing under load. That extra movement allows the knife to follow complex surfaces and shape both inside and outside curves. Although 5 inches of blade seems small compared to older designs roughly twice that size, the actual amount of edge that's used in a cut isn't usually more than half an inch. Cutting too deep and using too much edge simply buries the blade in the wood. For shaping tool handles (or wheel spokes), a sliding cut shears the work cleanly and puts the entire blade to good use.. The flexibility of the Flexcut drawknife allows shaping of shallow hollows like chair seats as well as outside curves (as in chair legs). Flexcut recommends it for roughing out duck decoys as well. The turned wooden handles press-fitted onto rat-tail tangs are reinforced with metal ferrules and should hold up well, but may feel awkward if you have larger than average hands. Think before you decide to base your workshop on the drawknife, because it's a useful but very specialized tool. This isn't a freehand tool and does require a solid holding system. Clamping the workpiece in a vise can be awkward and unreliable -- heavy draw cuts could pull the stock loose, creating plenty of opportunity for painful injury from both blade and workpiece. The most reliable clamping system -- the shaving horse -- isn't manufactured today except by a few renegade craftsmen. You'll likely need to build your own. The shaving horse uses foot pressure from a seated position to clamp long pieces of wood in place for shaving down and quick shifting. This traditional tool works very well, but get ready for blisters in unusual places.